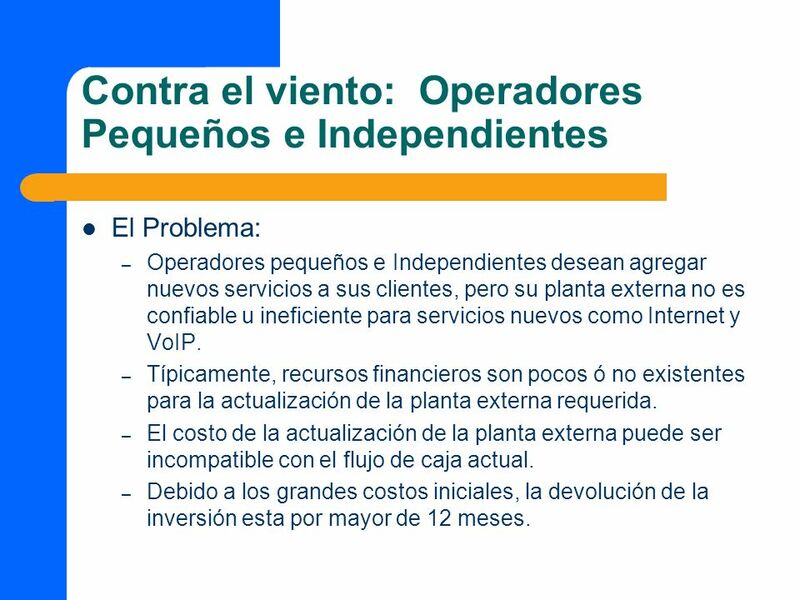 El Problema: Operadores pequeños e Independientes desean agregar nuevos servicios a sus clientes, pero su planta externa no es confiable u ineficiente para servicios nuevos como Internet y VoIP. Típicamente, recursos financieros son pocos ó no existentes para la actualización de la planta externa requerida. 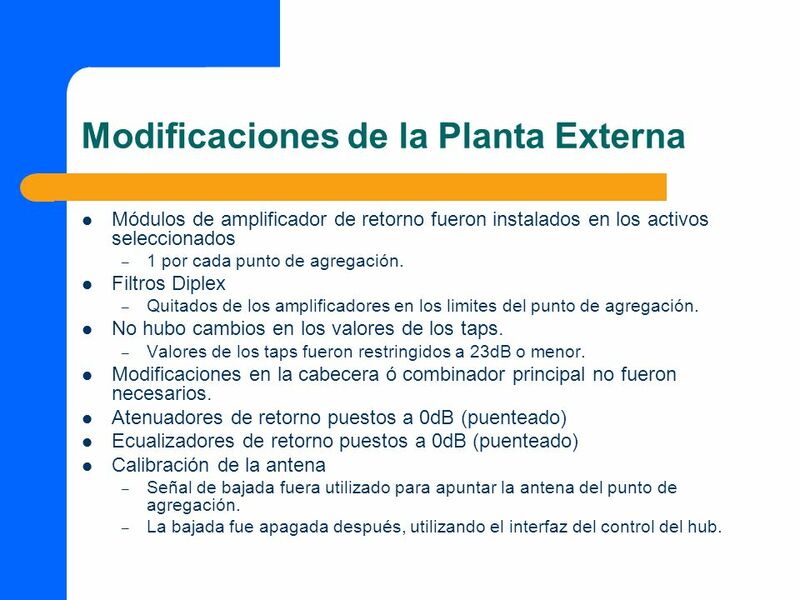 El costo de la actualización de la planta externa puede ser incompatible con el flujo de caja actual. Debido a los grandes costos iniciales, la devolución de la inversión esta por mayor de 12 meses. The broadband technology employed by cable television networks has existed for over fifty years. The large bandwidth available makes this technology a logical choice for additional service offerings such as VoIP, data interconnectivity and Internet. Large MSOs have already deployed these services and have been investing significant resources and capital into their networks to provide high reliability and bandwidth. The many smaller, independent cable operators are in a key position to continue to expand and deploy these value added services. However, in order to take advantage of this capability, these independent networks require return path upgrades and segmentation to improve reliability. Una solución factible debe solucionar los siguientes factores: Factores Técnicos Debe utilizar normas abiertas Debe ser confiable e escalable Debe consistir de componentes y tecnologías fáciles de conseguir. Debe tener un plazo de despliegue rápido. Debe tener una curva de aprendizaje corto para la gente de operación ey soporte. Factores Económicos Costos iniciales debe ser lo menos posible. Gastos operativos debe ser lo menos posible. El Costo Total de Operación (CTO) debe ser lo menos posible. El Plazo de Devolución de Inversión debe ser 12 meses ó menor. In many cases, the resources and capital required to upgrade a Tree and Branch 450 or 550MHz is not available. In addition, the standard business model may not allow the independent cable operator the luxury of investing in a rebuild, then investing again for the infrastructure required for the additional services. What is required is a means to begin a segmentation of the older networks and allow the operator to inexpensively and quickly launch value added services. This diagram illustrates the concept of the Wireless Upstream. The data transport utilized is the Data of Cable Service Interface Specification (DOCSIS) standard. The return is broken out at the last active in cascade, and sent to the headend via a wireless link. Since the wireless link is completely transparent to the DOCSIS PHY layer, no modification or other intermediary devices are required. Once the signal is received at the hub in the headend, the return output is delivered to the Cable Modem Termination System (CMTS). One way networks are limited by two factors: topology and active devices. The portion of the plant after the last active device could be considered “two way” since it is passive. Utilizing this approach, the operator can segment their existing network into smaller service areas by selecting areas after the last active, or between active devices in the distribution. The point at which the last mile return paths converge will become the “aggregation point”, usually at an active device. The return path can be “broken out” at this aggregation point and sent to the headend using license free wireless technologies. 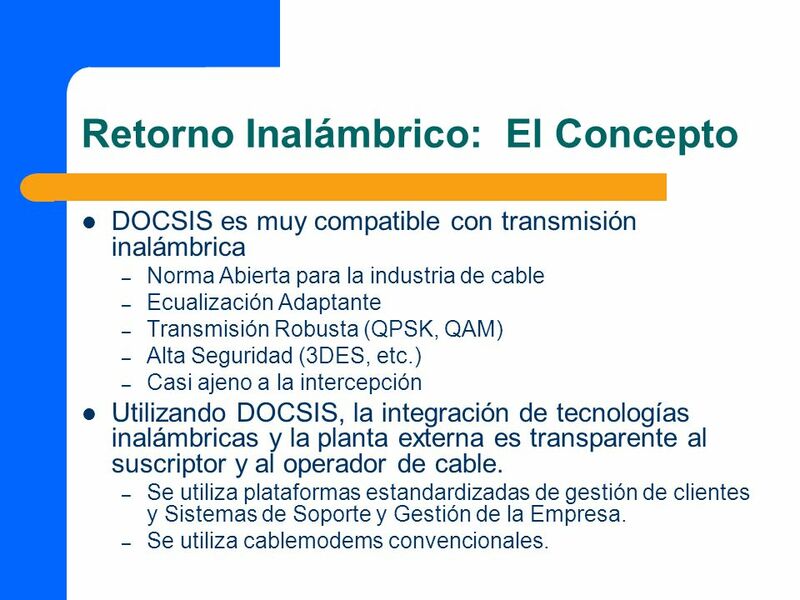 DOCSIS es muy compatible con transmisión inalámbrica Norma Abierta para la industria de cable Ecualización Adaptante Transmisión Robusta (QPSK, QAM) Alta Seguridad (3DES, etc.) 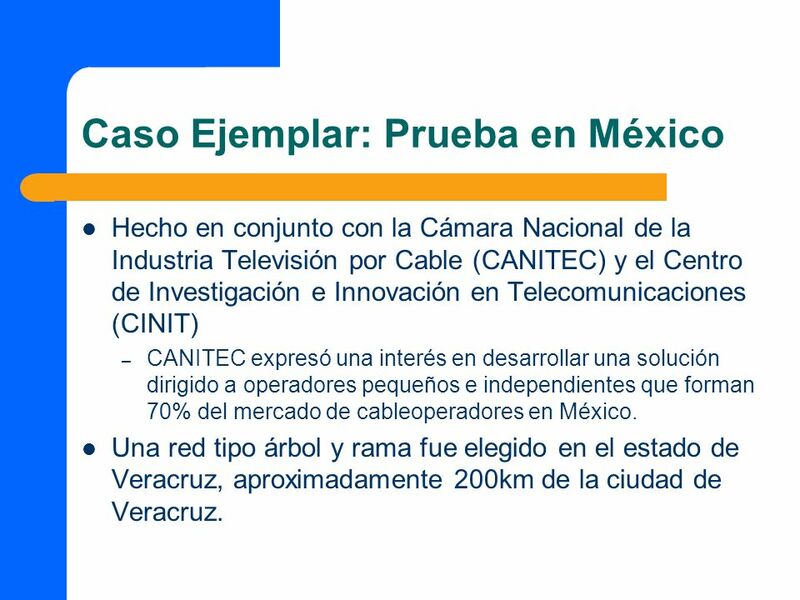 Casi ajeno a la intercepción Utilizando DOCSIS, la integración de tecnologías inalámbricas y la planta externa es transparente al suscriptor y al operador de cable. Se utiliza plataformas estandardizadas de gestión de clientes y Sistemas de Soporte y Gestión de la Empresa. Se utiliza cablemodems convencionales. The DOCSIS standard itself contains several features to assist with mitigation of noise and interference, which perform equally well in a properly configured wireless system. The cable modem is capable of automatically scanning a range of downstream frequency channels, finding the proper signal, and synchronizing to the data. This is useful when operating in a license free band where other signals may be present. Both the downstream and the upstream signals employ adaptive equalization, which is optimized for each individual user. Although designed to combat the multipath signal reflection interference present on a cable system, the DOCSIS adaptive equalization works equally well in a properly tuned wireless system. The DOCSIS upstream modulation is designed to combat the noise and interference ingress typically present in the low frequency portion of a coaxial cable network. The DOCSIS hub controls the frequency, data rate, timing, equalization, and output power of each subscriber. This capability provides robustness to the upstream in a wireless system. Both downstream and upstream signals employ forward error correction (FEC) to enable a low bit error rate (BER). Along with these attributes, a wireless system can build additional technology such as smart antennas, repeaters, and micro-cell architecture on top of the DOCSIS PHY layer. 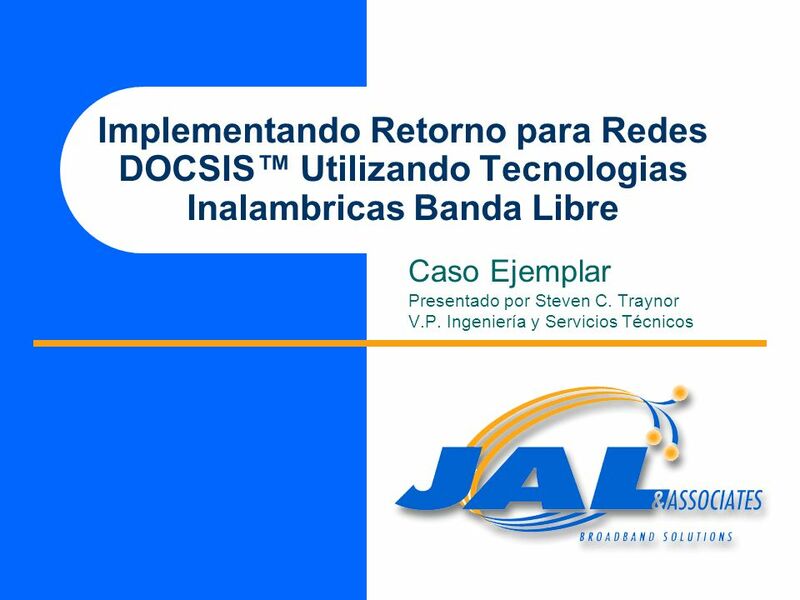 - Excerpt from “DOCSIS Out-Performs In Eliminating Deployment Bottlenecks In Wireless Broadband Access Systems”, Courtesy of Arcwave, Inc.
Hecho en conjunto con la Cámara Nacional de la Industria Televisión por Cable (CANITEC) y el Centro de Investigación e Innovación en Telecomunicaciones (CINIT) CANITEC expresó una interés en desarrollar una solución dirigido a operadores pequeños e independientes que forman 70% del mercado de cableoperadores en México. Una red tipo árbol y rama fue elegido en el estado de Veracruz, aproximadamente 200km de la ciudad de Veracruz. The purpose of this field trial was to evaluate the reliability and quality of a wireless upstream integration with a 450 or 550MHz Tree and Branch cable television network to provide DOCSIS™ based services to selected areas of the network. It was assumed that the levels of reliability and quality of the wireless upstream must be equivalent or superior to a standard return path using currently available optical technologies. It was reasoned that the downstream signal path would be provided by the existing network, and the upstream would be provided by the wireless network. 7 Alcance del a Prueba Niveles de salida del CMTS adecuados. 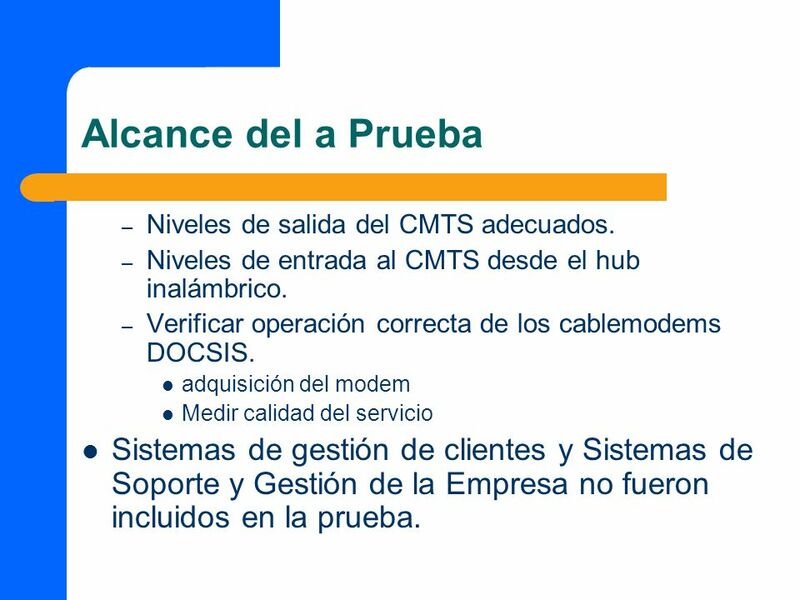 Niveles de entrada al CMTS desde el hub inalámbrico. 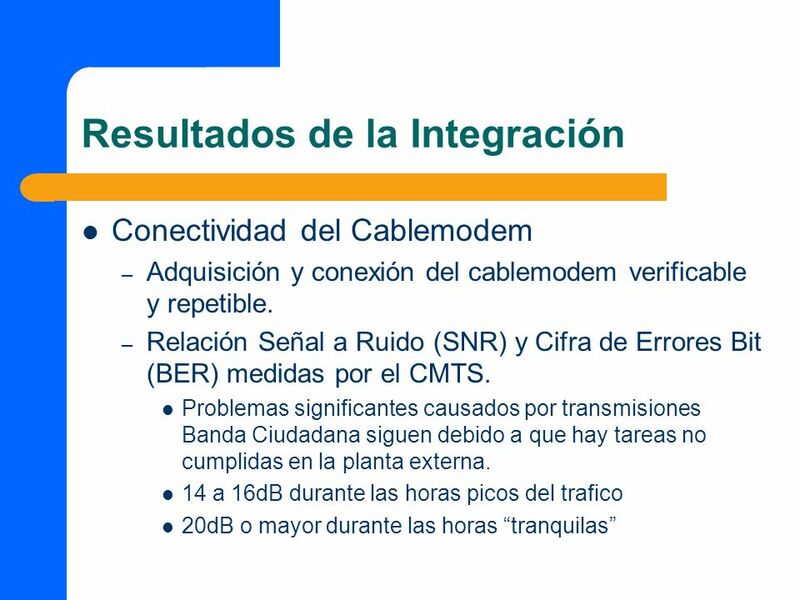 Verificar operación correcta de los cablemodems DOCSIS. adquisición del modem Medir calidad del servicio Sistemas de gestión de clientes y Sistemas de Soporte y Gestión de la Empresa no fueron incluidos en la prueba. A CMTS and appropriate provisioning software and server were provided to allow internet access via the cable modems deployed in the network. No subscriber management system was initially installed since this was considered transparent to the integration being tested. The following assumptions were made: Standard best practice for a DOCSIS™ deployment would be used as a template for deployment in the hybrid system. Measurements of upstream and downstream SNR as well as cable modem transmit and receive levels would be obtained from the modem’s status page or other suitable SNMP data. Signal levels would be similar to that observed in a standard DOCSIS™ deployment. La ubicación de los puntos de agregación fueron elegidos por un análisis del potencial del mercado y considerando la cobertura de la “ultima milla” Puntos de agregación fueron instalados en la salida de retoro del ultimo activo para proveer suficiente nivel de RF al equipo inalámbrico. 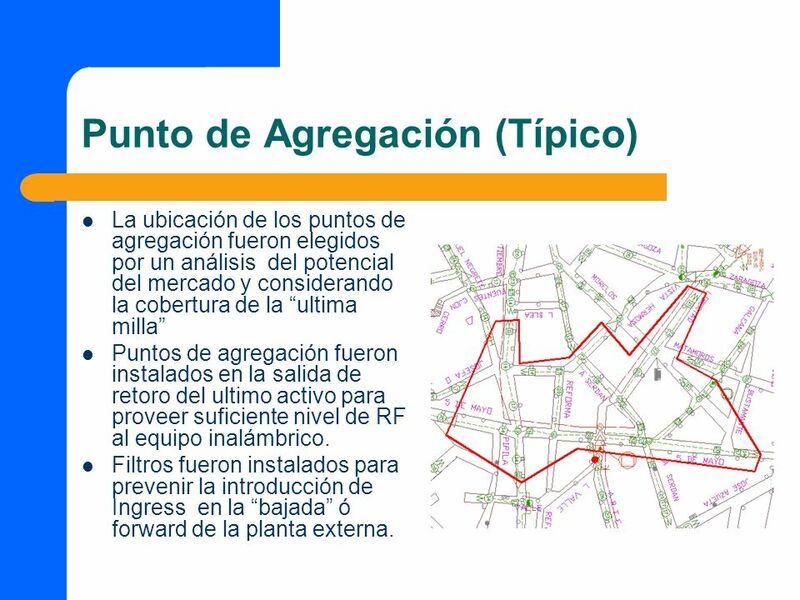 Filtros fueron instalados para prevenir la introducción de Ingress en la “bajada” ó forward de la planta externa. The plant condition was typical for a one way 450MHz system. In addition to some cable and tap replacements, some modification was necessary to the amplifiers at the edge of the testing areas to remove the diplex filters. The physical inspection revealed fractured cables, loose connectors and other impairments that contributed to the level of noise within the return band. It must be noted that no leakage testing was done prior to this field trial. A rudimentary spectrum scan using a field level meter was performed to view the return spectrum for possible problems. Return blocking filters were placed on all low value taps within each of the planned service areas. It was observed that due to the lack of a comprehensive leakage test, ingress noise was higher than would be desired in a standard DOCSIS™ network. In addition, several problems were observed with local Citizens Band radios in the 25 to 30MHz band. Installation of the wireless equipment was performed according to the installation practices and procedures as outlined in the manuals for the equipment. The network hub was mounted on a tower approximately 100ft above the roof of the operator’s office, which is a two floor building. Where feasible, coaxial cable of diameter 0.500” was used for long spans from the network to the individual antennas as well as from the headend to the hub. Power for the remote antennas was provided by local 110VAC utility and a NEMA 3R enclosure was employed to house the antenna power supplies and 12VDC power inserters. Brackets were custom manufactured for the remote antennas which provided precise antenna placement at appropriate heights in each of the service areas. 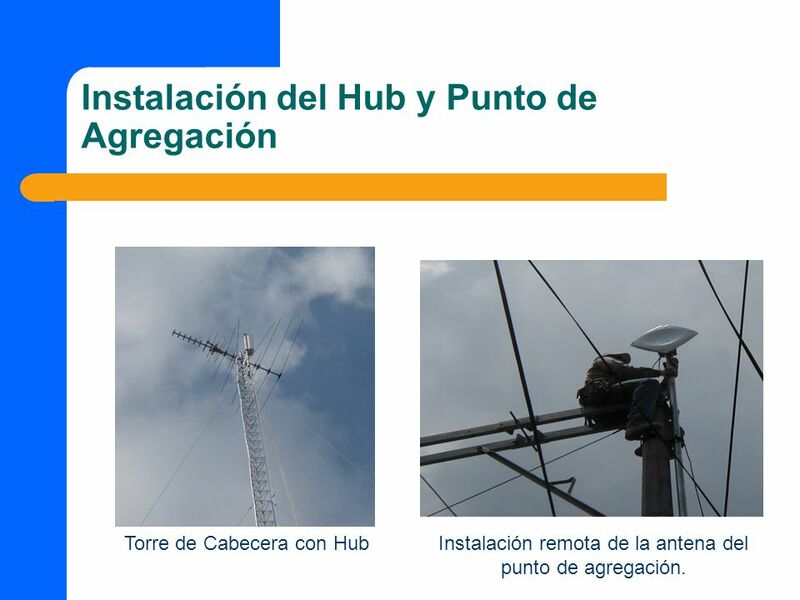 Torre de Cabecera con Hub Instalación remota de la antena del punto de agregación. Módulos de amplificador de retorno fueron instalados en los activos seleccionados 1 por cada punto de agregación. Filtros Diplex Quitados de los amplificadores en los limites del punto de agregación. No hubo cambios en los valores de los taps. Valores de los taps fueron restringidos a 23dB o menor. Modificaciones en la cabecera ó combinador principal no fueron necesarios. 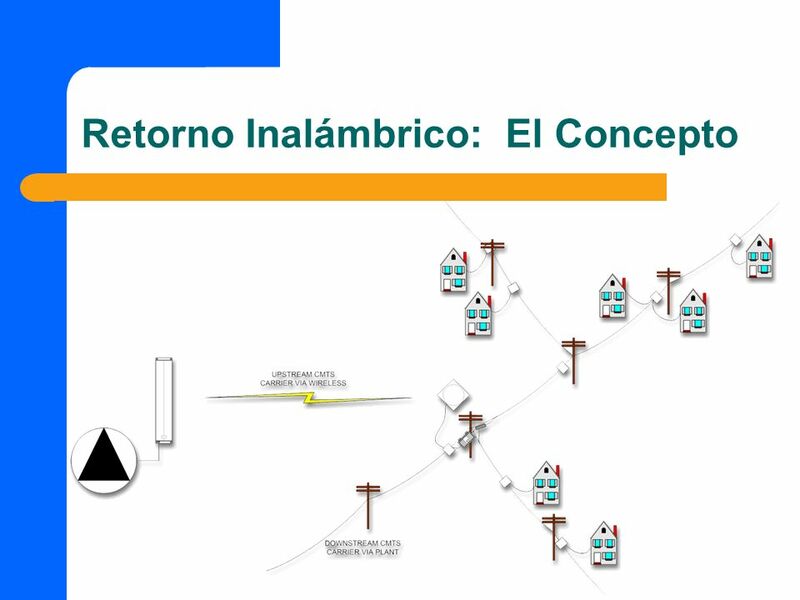 Atenuadores de retorno puestos a 0dB (puenteado) Ecualizadores de retorno puestos a 0dB (puenteado) Calibración de la antena Señal de bajada fuera utilizado para apuntar la antena del punto de agregación. La bajada fue apagada después, utilizando el interfaz del control del hub. Off the shelf return modules and diplex filters were installed in the amplifiers that served the aggregation point service area. No tap values were changed in the installation; however, the maximum acceptable tap value for a subscriber connection was limited to 23dB. The line of sight setup of the equipment was done with the downstream carrier of the CMTS. Air frequencies were chosen that allowed the cablemodem to maintain the same downstream RF frequency as the output of the CMTS (435MHz), which was 5.735GHz. The upstream frequency was chosen to be 5.333GHz, as the upstream channel on the CMTS was configured (initially) to 33MHz. Signal levels into the hub were set at 18dBmV for the downstream using the upstream attenuator in the hub and an additional 14dB of attenuation at the upstream receiver on the CMTS. The upstream squelch filter was active during this phase of the testing. A spectrum analyzer was used to “peak” the downstream signal. Once the calibration for the antennas was performed, the CMTS downstream port was disconnected from the hub antenna and connected to the forward combiner. The downstream output level of the CMTS was measured directly at 44dBmV. Measurements of channels adjacent to downstream carrier were taken and the CMTS output was injected approximately 6dB below the video carrier level. 11 Protocolo de Pruebas Niveles de retorno y estado fueron obtenidos utilizando los datos de cada cablemodem y utilidades SNMP de dominio publico. 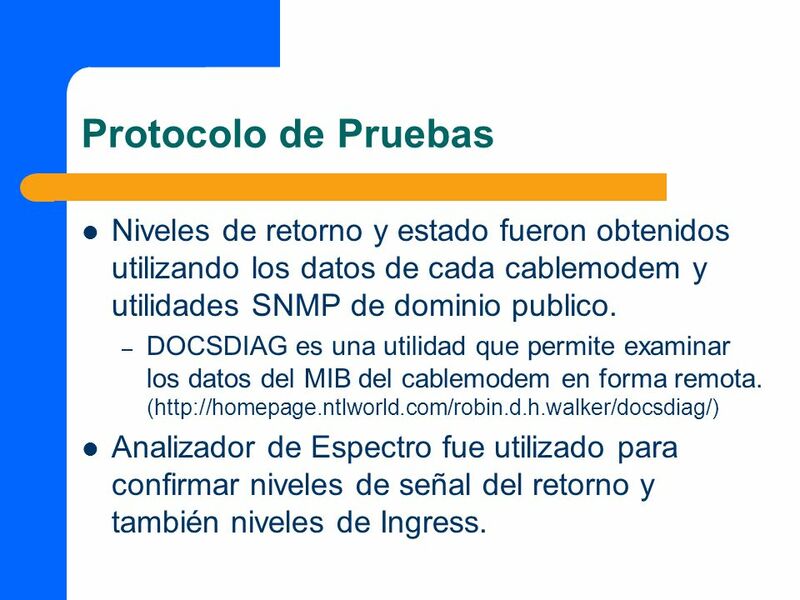 DOCSDIAG es una utilidad que permite examinar los datos del MIB del cablemodem en forma remota. ( Analizador de Espectro fue utilizado para confirmar niveles de señal del retorno y también niveles de Ingress. A software utility “DOCSDIAG” was used to determine the cablemodem output level via remote SNMP MIB walk. It was estimated that the signal levels arriving at the remote antenna are between 38 and 45dBmV. Field installable diplex filters were not available for this trial, so a workaround that consisted of a low pass filter (5-42MHz passband) and a mainline splitter, to open the network and send the upstream through the Aggregation Point. It was reasoned that the low pass filter would prevent any unwanted ingress in the 5.7 to 5.8GHz band from entering the network. Ingress mitigation was performed using a spectrum view of the upstream and several cables and connectors were replaced, providing improved return noise performance. The upstream squelch filter was enabled for the entire test. An improvement of up to 6dB was observed using the upstream squelch filter over a “wide open” return. Finally, return path filters were installed on all active customer drops in the aggregation points. This was done to help mitigate ingress from connected subscribers. Conectividad del Cablemodem Adquisición y conexión del cablemodem verificable y repetible. Relación Señal a Ruido (SNR) y Cifra de Errores Bit (BER) medidas por el CMTS. Problemas significantes causados por transmisiones Banda Ciudadana siguen debido a que hay tareas no cumplidas en la planta externa. 14 a 16dB durante las horas picos del trafico 20dB o mayor durante las horas “tranquilas” The downstream signal level was arriving at the cablemodem between -1dBmV and +1dBmV. The upstream cablemodem output level was +48dBmV to +58dBmV. The upstream input level to the CMTS was set at +25dBmV, in order to help with the ingress and citizens band radio problems. Several cablemodems were deployed at subscriber’s homes with computers, to begin initial downstream speed testing. Tests were done informally using web site testing tools such as In many cases, drops had to be replaced due to their deteriorated condition. It was determined that the most effective upstream noise strategy would involve re-using the return path filter on the drop on the television side of the two-way splitter. In this way, much of the ingress from the subscriber’s home cable network can be reduced. Micro reflections, due to damaged drops or passives also played a significant role in the upstream performance. 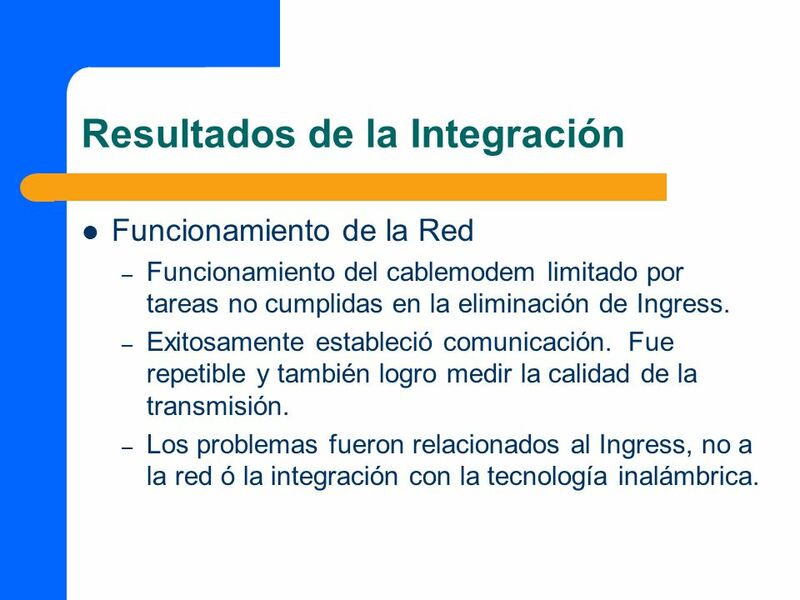 Funcionamiento de la Red Funcionamiento del cablemodem limitado por tareas no cumplidas en la eliminación de Ingress. Exitosamente estableció comunicación. Fue repetible y también logro medir la calidad de la transmisión. Los problemas fueron relacionados al Ingress, no a la red ó la integración con la tecnología inalámbrica. The wireless upstream components were installed prior to most of the return noise mitigation efforts. Most of the corrective action that was taken was done via visual inspection and return spectrum analysis. It was strongly suggested that a program of routine leakage testing be implemented to enhance the return path performance. Several large points of ingress existed within the three aggregation points. Primarily, Citizens Band (CB) radios posed the greatest threat. SNR upstream and downstream SNR was measured using the DOCSDIAG utility. Initially the SNR proved to be low, typically around 14dB; however, once the ingress mitigation efforts were under way, the SNR had improved to almost 20dB. Much of this fluctuation can be attributed to the CB radios, as there are quiescent periods during the afternoon where the communication is less. When there is CB radio activity, the SNR drops to 14 to 16dB. Signal level was a problem in two points of the network due to suspected bad drops and possible damaged taps. Packet retransmissions and uncorrectable errors were minimal for the majority of the time. Only when CB traffic became excessive did a noticeable increase in dropped packets occur. Costo de integración comparado con el costo de la reconstrucción de la red. 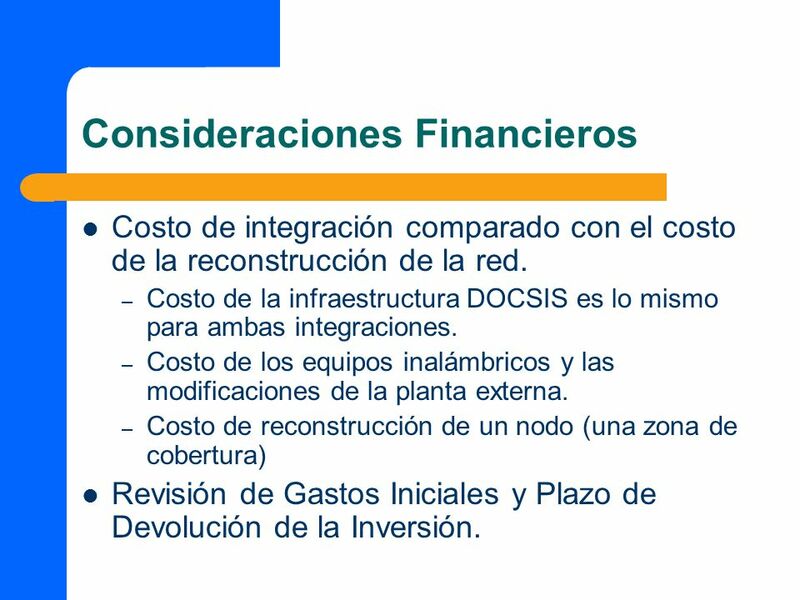 Costo de la infraestructura DOCSIS es lo mismo para ambas integraciones. Costo de los equipos inalámbricos y las modificaciones de la planta externa. Costo de reconstrucción de un nodo (una zona de cobertura) Revisión de Gastos Iniciales y Plazo de Devolución de la Inversión. The Wireless Upstream data was based on a wireless upstream integration covering approximately 900 active users (1300 homes passed) where one hub serves approximately 300 subscribers. Each remote antenna served approximately subscribers, requiring about three to four remote antennas per hub. The reconstruction with fiber data was based upon a node rebuild of approximately 14.2km of cable plant used to cover 1310 homes. The density was approximately 90 homes per km. The design used approximately 2.6 actives per km, not including the node. Total bandwidth was 870MHz and the equipment was new. 25% of a forward path transmitter of 10dBm output as well as 50% of one return path receiver was included in the cost of the node. This graphic represents the expected time to recover a capital investment of approximately $38,000 over the course of three and five years, considering an overall take rate of 67% over five years. The average take rate is less than 15% per year. The customer is assuming to provide basic DSL replacement service in Mexico, which is 256/64kbps. The Average Revenue Per User or ARPU is expected to be $US35/month, with a one time installation fee of $US35. It is assumed for the purposes of this exercise that EBITDA is 45% of revenue ($US16/month) with a corporate tax rate of 23%. The positive cash flow after two months is due to the fact that there was a capital expense for one aggregation point for each 100 subscribers added. This cost information is calculated on a per user basis for approximately 906 users. The cost per home passed will be lower, as the total amount of homes passed is approximately The service area is 54.11square km (24 square miles). The radius of coverage from the headend is approximately 8km (5 miles). The sector of coverage is 90 degrees. It was determined that three 90 degree antennas were required to cover this area in order to meet the data throughput requirements of around 900 simultaneous users. This cost analysis does not consider the cost of the DOCSIS equipment such as CMTS, Cablemodem, TFTP servers, etc. It was assumed for this exercise that these costs would be nearly identical to the reconstruction model and therefore, have negligible impact on the calculations. 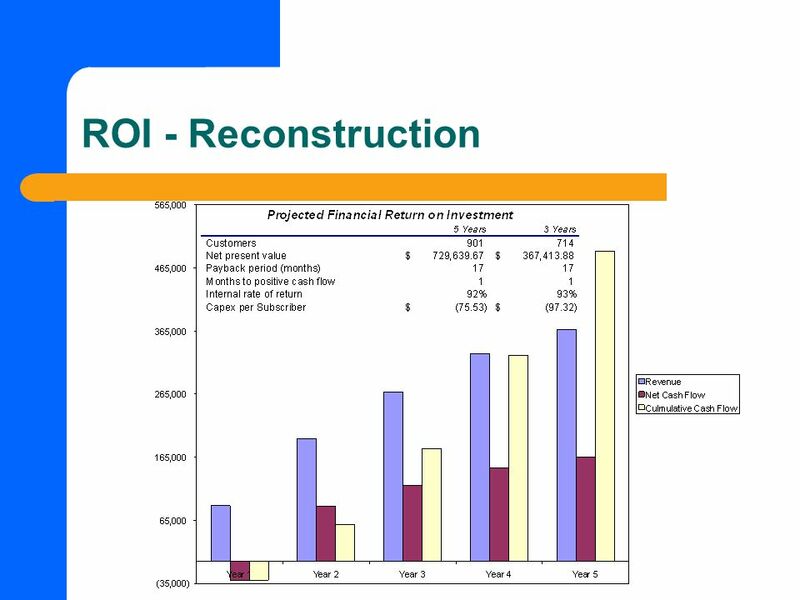 16 ROI - Reconstruction This graphic represents the expected time to recover a capital investment of approximately $69,500 over the course of three and five years, considering an overall take rate of 67% over five years. The average take rate is less than 15% per year. 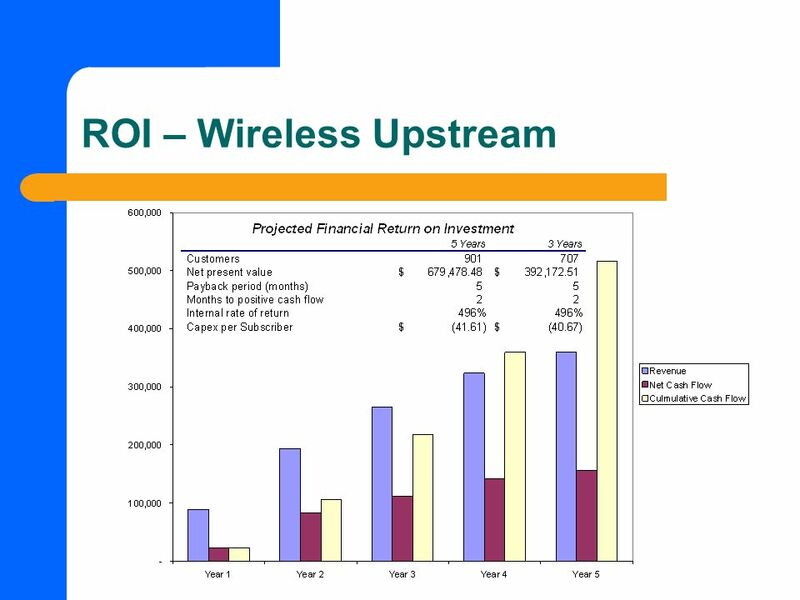 The business model for the reconstruction is identical to the Wireless Upstream model. The positive cash flow after only one month is due to the fact that the total investment for the rebuild was paid up front. This cost information is calculated on a per user basis for approximately 900 users. The cost per home passed will be significantly lower, as the total amount of homes passed is approximately The service area is approximately 14km of plant. The calculation assumed that the design used two output bridgers (scalable to four with internal splitters), single output line extenders, and one four output optical node, equipped with one standard gain forward receiver and one standard F-P return path transmitter. The headend costs were assumed to be 25% of a 10dBm forward path transmitter, 50% of one dual return path receiver and the appropriate power supply and rack. The cost of the fiber and the coaxial cable was considered, as well as the appropriate balancing accessories, taps, connectors, power supplies, etc. The rebuild design was done at 870MHz. As in the case with the wireless upstream model, this cost analysis does not consider the cost of the DOCSIS equipment such as CMTS, Cablemodem, TFTP servers, etc. Y esta sujeto a todos de los requisitos de una implementación DOCSIS convencional. 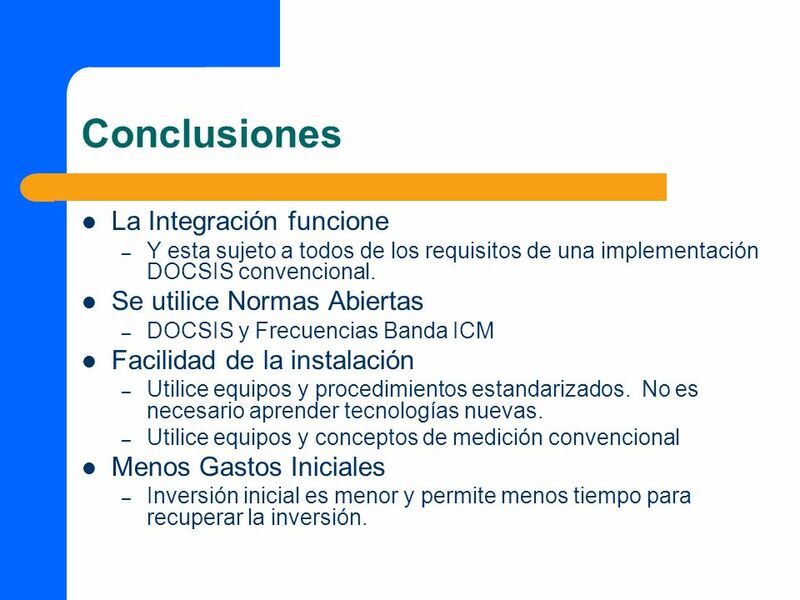 Se utilice Normas Abiertas DOCSIS y Frecuencias Banda ICM Facilidad de la instalación Utilice equipos y procedimientos estandarizados. No es necesario aprender tecnologías nuevas. 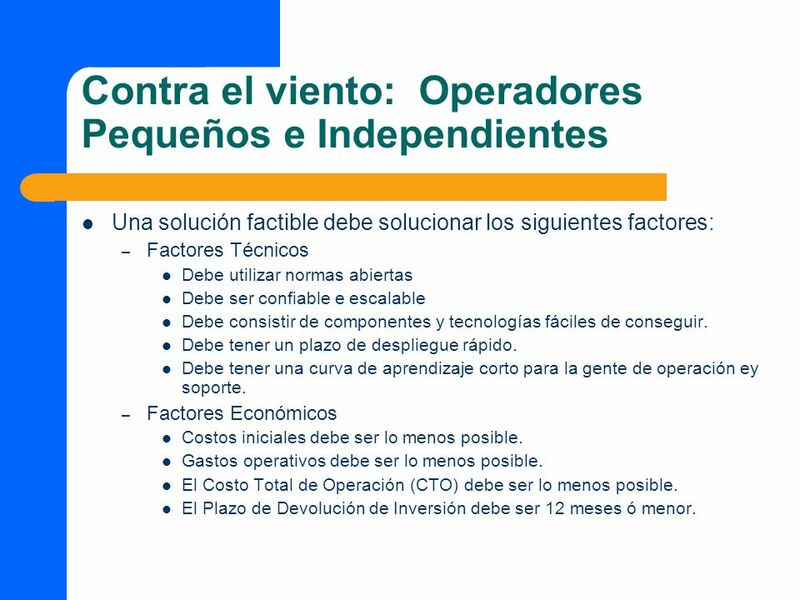 Utilice equipos y conceptos de medición convencional Menos Gastos Iniciales Inversión inicial es menor y permite menos tiempo para recuperar la inversión. The results of this testing clearly illustrate the feasibility of the integration as the communication links were repeatedly established and functioning between the CMTS and cablemodem, even though the return path was still under calibration, and ingress cleanup had only been partially completed. This integration clearly demonstrates that success can be achieved when using standards based technology. The license free wireless technology chosen for this integration employs the strong, proven standard of DOCSIS™. The operation and maintenance tasks of this integration are very common and do not require any investment in high performance non-cable related test equipment. Simple tools and standard practices provide all that is necessary to launch a wireless upstream. It allows the cable operator to target business customers and begin launching corporate data services, faster than possible with traditional plant upgrades. The initial capital expense is much lower, since only the required parts of the cable plant are upgraded. Finally, the additional income generated by the new services will help offset the cost of additional plant upgrades. Descargar ppt "Caso Ejemplar Presentado por Steven C. Traynor"
© 2006 Cisco Systems, Inc. Todos los derechos reservados.Información pública de Cisco 1 Prestación de servicios para trabajadores a distancia Acceso a. ¿ Que es la television por cable ?